If you're talking about Jebus then yes, i don't play the "right" multiplayer. Let me mention some OP things for big final battles: AA or Ironfist of Ogre with Cape of Silence equipped; Expert berserk; Expert clone; Blind last stack+whatever the heck you got in your book. Now explain me why mind spell immunity should be of a lower value when it is so crucial in such situations. I guess you can't since all you want is some fancy stuff that can be grabbed from ground which will magically protect allied units from mind games. Maybe it is time for you to play rich mirror templates to understand why i never take custom maps seriously because the vibes you give imply that maps are somehow superior to templates which definitely feels awkward. @Orrinisthebest Maps build precisely and planned in detail by the author are always supperior to randomly generated templates. Nothing You said is new to me. I'm no newbie and I'm aware of stuff like Cape of Silence blocking 3/4 AotD spells, but not blocking the Ironfist of the Ogre haste etc. HotA combination artifacts > HotA regular artifacts > SOD combination artifacts > regular SOD artifacts. I believe you don't know stuff like: Ogre mages can't cast mass bloodlust on fiery fields? Nevertheless, the artifact could be of same mechanic, as the Armageddon Blade, which can't be generated anywhere if not set in the editor, so that it would have singleplayer use only equal to AB and HotA's title artifact. 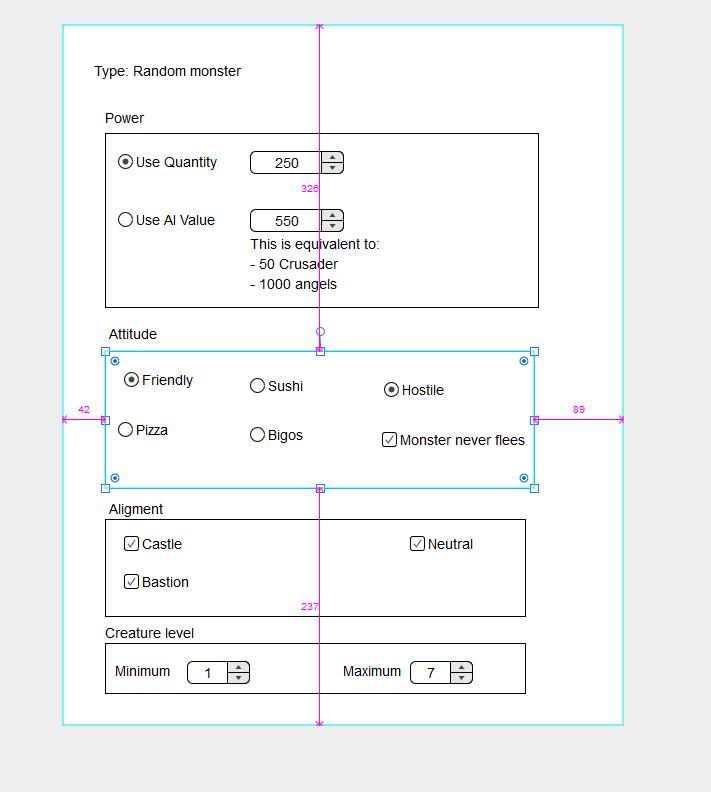 You know, if someone close to me said that maps>templates i'd punch him in the face. And it seems futile at this point to explain why maps will always stay behind temps but you need to understand, just one piece of relic replacing 4 artifacts ( even if they're treasure class) is way too powerful, not to mention the fact that +90% of the time those arts will belong to seers. Again im not against mapmakers having a cool object like that ( similar to horn or arma blade in terms of availability) but if any art is going to get such feature it should be titan's thunder, nothing else. @Orrinisthebest For multiplayer and regular playthrough 100% agreed. Didn't considered that on my first post about it here. Aha So good point again. I would simply hate the padlock crap for such an useful mapmaking-use item, that's why I critized the idea as a whole on first reply. I doubt you'll understand it, but padlocks on such an item would limit my "profession" alot. I'm happy we came to an agreement featured around similar mechanic to HotA and AB. I suggest rework the dead trees images. In my opinnion they are ugly and dont very easy to distinguish. When I started to play h�roes almost twenty years ago, I though they were cracks in the ground. I like how HoTA adds more merit and purpose in having water-based maps, as there are more world objects in the water and new mechanics. There should not only be unique world objects for each terrain type, but some new mechanics to spicen things up add more individuality to each terrain type. Edited by Rakso at 15:02, 03 Feb 2019. I hate how you can't swim anymore onto objects yellow tiles when on water, as you could on SOD, but can only pick them from a near-tile. It's awful imo. Wished to make a Sirens puzzle on a map of mine, but couldn't beacuse of it. I'd suggest HotA Crew to change it, if it's not a big deal. Eagle Eye King (combination artifact) can learning 5 level spells in the same 90% change, because of EE artifacts give extra 30%. Combination artifact can learning also master genie casts spells, for example. But if hero hasn't EE skill, combination artifact doesn't work. Learning artifacts, you know extra 5, 10 and 15%. It demands learning skill with like EE artifacts. No combination. Search for only one scholar artifact, it supports hero can learning and teaching 5 level. First Aid casts cure and resurrection like WoG by basic, advanced and expert skill with. How? Yes First Aid artifact supports and hero must owning FA skill. No easy! You can test them, for random map. Edited by Lth3 at 10:34, 07 Feb 2019. AI doesn't sacrifice or sell artifacts. I wonder HotA, because heroes 3 complete or the best example of RoE, AI will sacrifice artifacts. We must invent something, when learning is useless, if map offers maximum 27 level. And if in a map has only pyramid gives fly, you can't find in mage guild or tome of air. I/we give single example. Guys don't you have an impression that Wizards from Tower are the worst magic heroes at the start. I'm thinking here about combination of specialty + basic skills + path of development. Wizards besides Warloks should be one of the most powerful mages but unfortunately what is really sad they aren't. I can imagine that now you're thinking about Solmyr but when we compare him with mages from other factions we'll see that he is not in the top. Each faction posses better mage hero at the start, even Caithlin seems to be a little bit better for some maps. Because of that I have an idea to a bit buff one hero from Tower. I'm thinking here about Deremyth. From my side she could posses specialty in intelligence. This is a bit weird that city of mages doesn't posses hero with this specialty (even Fortress posses Andra). I can understand that might heroes in Tower are the worst but Wizards should be compared with Warlocks not with Witches. Don't forget that Warlock additionally posses Mana Vortex. Wizards primary skill progression, they are, the only magic class to have more chance to get attack than spell power after the tenth level (a mistake that was not present in Heroes II, where they debuted). Yes. Indeed, I argue that Wizards should be "wearing the crown of magus of the magi" and for a very simple reason: first, the word's etymology refers to wisdom, meaning that wizards are known by their intellectual, not physical, prowess. In the Might and Magic Universe (and to fantasy settings in general), wisdom/intelligence is equated to arcane lore, which can be achieved, generally speaking, in two ways: either you're born with the gift or through extensive study. No magic class of Heroes III suggests the first and, the way I see things, classes are mainly differentiated by their interests/what they do with their time most of the time (a metaphor for the probabilities of advancing in their primary skills). Therefore, it makes way more sense that this archetypal conjurer's time is entirely dedicated to the pursuit of arcane lore. In fact, by making their advancement 30/20/20/30 after the tenth level, one is creating an entirely new kind of spellcaster, a snow battle mage, maybe? (the snow was added to avoid copyright lawsuit from the Stronghold golbin lawyers). Also, it makes 0 sense that the town whose very foundation is magic: they live in a magocracy, they have the library to learn more spells, etc. should have such a mediocre magic class. One could argue that worlocks should rival Wizards in power and I tend to agree. I think Heroes II did a better job in this aspect: sorceresses would favor knowledge over spell power, Warlocks would favor the opposite, while Wizards would take both (not to mention that there they did not have the wretched post level 10 scaling : Heroes II Primary Skill Advancement . However, Wizards, then, were seen as the superior magi (thus, their unique building was a magic one and they had better chances to get magic secondary skills), which, the way I see things, makes way more sense and enriches the diversity of the classes. 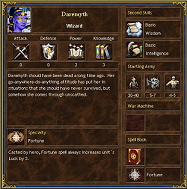 Heroes VII, which, despite its glaring flaws, was a paragon in terms of heroes fitting their classical archetypes: there, Wizards are true maestri of magic: they have excellent magic attributes, a unique secondary skill that greatly boosts their magic prowess AND they have BOTH the library and the magic well (named Mana Core, as you can see here: https://guides.gamepressure.com/mightandmagicheroes7/guide.asp?ID=31825). That is to me what we should be aiming at (maybe giving the warlock something that increses their knowledge by 1, a la Heroes V). Since the new version will be about a town called Factory maybe make so to differentiate between standard Golem Factory and All-4 Golem Factory. 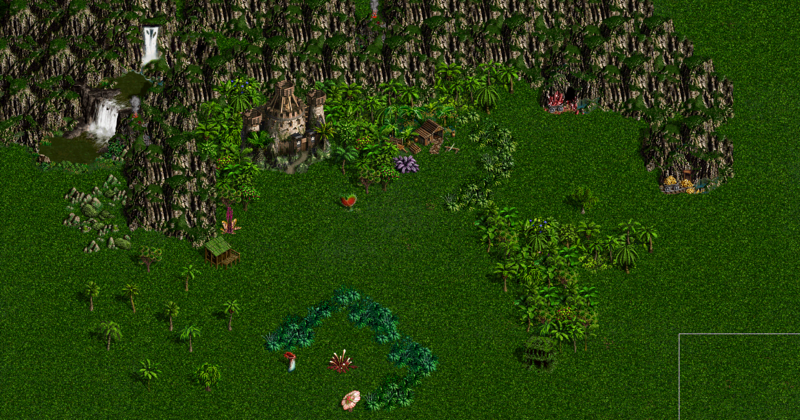 -New terrain as Cove native terrain: Tropical. *Fakir & Ascetic are inspired from M&M 6 Cultists/Followers of Baa. *Nomad Chief is like Nomad from Heroes 1: Blue clothing & headress. Lv.4 & Lv.6 remain empty. One of them would be a flyer. Edited by ginden at 14:12, 07 Feb 2019. Few maps that I plan to create would have use of option "you win, if you survive until month 3". Time limits (Special Loss Condition) can have changed interface - game already supports setting them for arbitrary number, but GUI limits these to list of options. I'm not sure if it's possible, but I would like to have mirrored version of many objects on map. Objects with external shadows (AFAIR - it's pink pixel in DEFs) can be just mirrored even in Paint. Unfortunely, most of objects have "internal shadow" - these have darker pixels in their DEFs, representing shadows (this looks very unnatural for eg. Subterrean gates). Option to disable castle requirement in map options. Edited by Lth3 at 14:16, 07 Feb 2019. Ok yes in multiplayer. 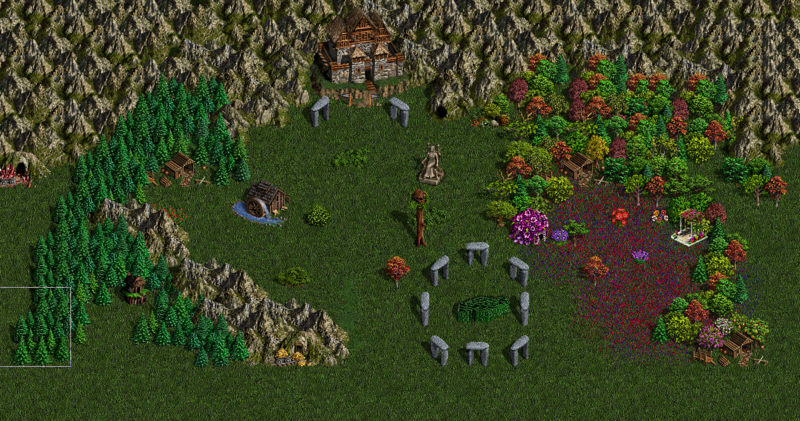 The same town portal in mage guild. I love random and what map/homm demands strategy. Example of strategy, I don't remember one RoE map's name, in there islands and in underworld lives Dungeon. A map has only shipyard. A boat goes to artifact's places. But expert water is much faster than trip to shipyard. My friends banned water skill when relic artifacts are power. But I visited Dungeon and other place. Ok game always been fooled. Because of random spell in mage guild. So they think much better not allowed to go artifact's places, and this map got a rule. When labeled a map. Now's sure pro players don't like random artifact is a problem matter. Remember also in there always be artifact, but if search for artifact, it starts feeling rarely artifact. The same skill like FA. And we need learning, etc changes balance and understanding. A many maps like realm of chaos can't strive for 27 level, if I remember correct. And random patronizes player. But if player refuses learning, etc Another gets 45% experience points. The thing isn't also hard understanding. Edited by Lord_Immortal at 21:01, 10 Feb 2019. I think the HotA team should work on something similar in the future patches, once they're finished with the Factory. Ok yes in multiplayer. The same town portal in mage guild. The thing isn't also hard understanding. I don't play multiplayer then. They are getting very strong: summon elemental, etc against 3-4 level spells. I don't use a HOTA spell research mechanic. * tower is unquestionably the weakest faction on jebus cross. my idea for buffing it would be to enable ancient lamps on jebus, only on the snow terrain. they should be rare, but still allow the player to build a sizeable stack of master genies to help clear the map. however, i don't know if it's possible from a technical perspective to only enable this object on snow. * grindan and labetha (and to a lesser extent alamar and jeddite) on mirror maps can give one player an enormous advantage when they happen to appear in your tavern. arguably more of an advantage than gunnar / dessa / kyrre, who are disabled on mirrors. i would also disable these heroes on mirror maps.